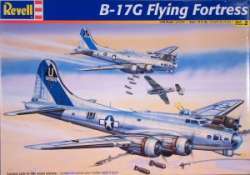 This is a reboxing of the original, and still unsurpassed, Monogram 1/48 B-17G Flying Fortress and what is more, it still includes the Shep Paine "Tips on Building Dioramas" leaflet! "El Lobo II", 457th Bomb Group, natural-metal finish. "Chow Hound", 91st Bomb Group, olive drab over light grey finish.